The Castle Cross the Magnet Carter sweeps American history from 1941 to the twenty-first century through the lives of four men--two white brothers from rural Alabama, and two black brothers from small-town Maryland--whose journey culminates in an explosive and devastating encounter between the two families. 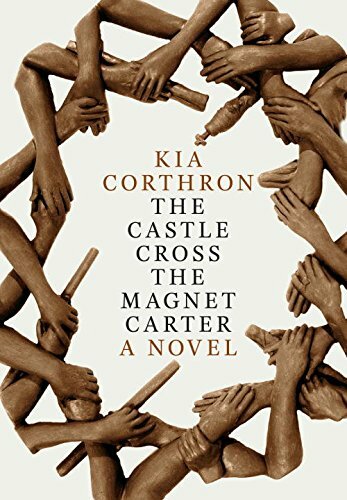 Magnet Carter qualifies as a full-blown saga, with historical scope and a literary heartbeat, and uses the trajectories of its characters' lives from 1941 to 2010 to illustrate the human cost of America's legacy of slavery. It's daring, poetic, and unapologetically political ... in addition to being political [it] is also funny, emotionally capacious, and dramatic ... Equally central to the stark political, racial, and socioeconomic realities of Corthron's vision are the striking poetics of her language, which mixes erudition with vernacular with bold imagery, all beautifully cadenced. This is a heavily stage-crafted novel and frequently sacrifices believability for polemic—one chapter crams together plots concerning police brutality, abortion and homosexuality. It’s Ms. Corthron’s command of dialogue that keeps things motoring. Complex personalities are revealed through long, absorbing conversations, even in the affecting New York section, in which the courting is done in sign. Binding this impressive novel is a beleaguered concept of justice. There is significant flab on these bones, sins of writerly self-indulgence and authorial indiscipline. Even minor characters are run through mazes of back story and digression that add little appreciable dimension to the plot ... Which is not to say Corthron’s experimentation and license are uniformly frustrating. To the contrary there are whole chunks of writing here that are simply sublime, places in which one gets swept away by the way she subverts the rhythm of language to illuminate the familiar and allow it to be seen fresh ... what Corthron does best in this book: She blindsides you. She sneaks up from behind. Sometimes, it is with moments of humor, but more often with moments of raw emotional power. What did you think of The Castle Cross the Magnet Carter?